Smartphone in need of an upgrade? 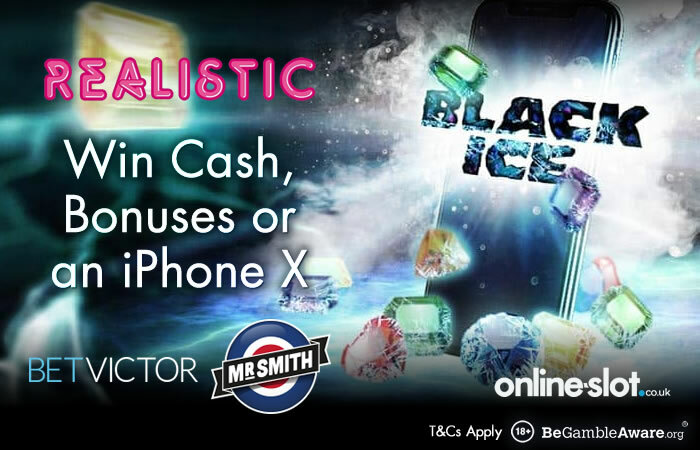 BetVictor Casino and Mr Smith Casino are both giving away iPhone X devices this week to mark the launch of the new Black Ice slot from Realistic Games. There’s also plenty in the way of cash and bonuses up for grabs too. You’ll have 3 days to complete your bonus spins which have a 10x play through requirement. Not got an account? Sign up now and deposit just £10 to get £50 worth of bonuses on various products. The iPhone X is the also top of the bill as far as the prizes go in the Black Ice competition at Mr Smith Casino. This one is a leaderboard race. First click on the Take Part tab, then get playing on Black Ice. You’ll have 7 days to complete your bonus. Register an account to get a generous 100% first deposit bonus up to £200 – deposit from £15 to £200 to get a 100% match (i.e. deposit £200, get a £200 bonus). Black Ice is a super simple but highly playable slot from Realistic Games. Played using a 5 reel, 10 payline game engine, it comes with respins following every winning spin. Look out for extra wilds that are added to the reels during that respin which can really boost your winning chances. Take Black Ice for a spin this week and you could be the proud new owner of a shiny new iPhone X.